These kinds of things are pretty rare over here (and by over here I mean in Italy) as people are more prone to having a quick caffè (espresso shot) and something sweet, generally in the cake or cookie family as their routine breakfast… certainly nothing with protein, heaven forbid! Thankfully, I’ve never been a big fan of cookies, cakes, sweet jam or custard filled croissants and brioches or anything of the sort. 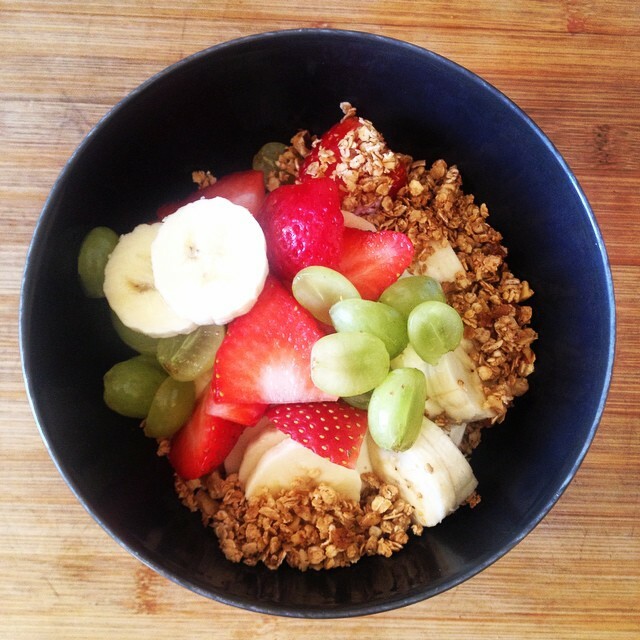 So… back to the granola. This weekend I found raw oatmeal at a bio store with a friend (oatmeal isn’t easy to find) and thus my desire for homemade granola with Greek yogurt and fruit was no longer only a mere thought… but it became a delicious little reality on Sunday morning. I opted for a “healthy” mix, staying away from butter and added sugar aside from the 2 tablespoons of honey. (A little butter actually makes it pretty amazing, for those who are not trying to avoid it). Prep time 20 mins. Bake time 10-15 mins at 300F or 150C and once it’s light golden brown remove it from the oven and let it cool. Top with Greek yogurt, fresh fruit and a drizzle of honey!